[SG] Badoque | hidden Halal cafe with decent food! My first time visiting Simpang Bedok, amazed by the tons and dozens of food stalls around the area. Somewhat like our Tze Char style and some more atas coffee shops, it was bustling with lots of diners when we arrived at about 8pm. One of the few halal western places that I know of, I must say it has quite the right ambience for a Friday night chillin’ session. Highly raved about by Rozz on 98.7fm according to my friend, it thus got her extremely excited, deciding on Badoque as our dinner destination. 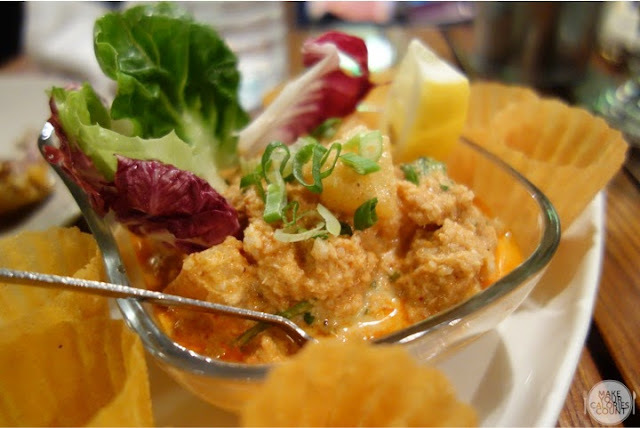 Famished by the time we reached, we dug into its starters immediately, before taking our time to decide on our mains. 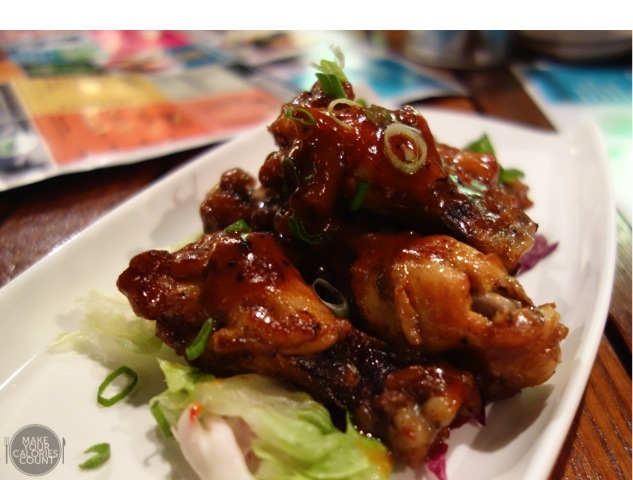 A fan of chicken wings/drumlets, how could I miss this? Finally getting our stomachs filled after feeding our cameras, my first bite was quite an anticipatory one, and satisfied by the sauce. The drumlets itself was, however, rather disappointing where the meat was slightly overcooked and on the tougher side. The sauce tasted good on its own, but didn’t manage to be infused in the flesh itself, perhaps with the lack of marinade. Good for curbing any cravings you might have, but don’t bear high expectations on satisfying it! This was one that we got pretty impressed by, and caught our attention with its mentioning of crabs! With crispy pie tee shells and filling it ourselves, it was quite a fun way for us to prepare our own food and maintaining the crisp layer of the shell. The mixture itself was quite a surprising flavour that caught me off guard. I was expecting some chilli crab paste that might get a little monotonous after a while, but my first bite was a refreshing burst of pineapples in it! The combination might have sounded a little weird, but it went perfectly great when we tried it, as the pineapples they chose were crunchy yet having no tinge of sour-ness at all! The texture also helped break the monotony each mouthful, and the juices went well with the otherwise-jelat mixture. I would have preferred more crab meat inside, as I couldn’t really taste it in the mixture. A satisfying mouthful of goodness nonetheless! 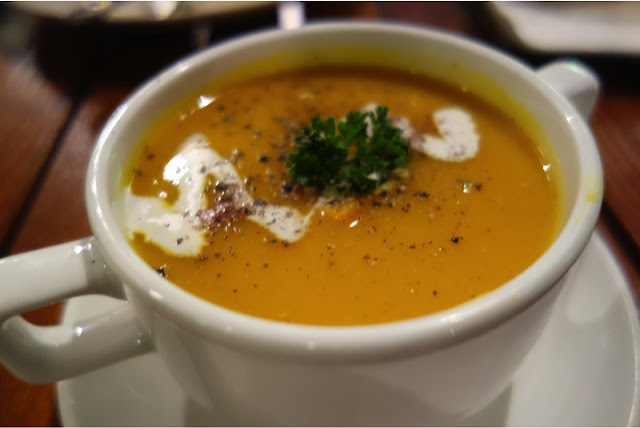 It is said that pumpkin soup is a natural happy soup, with pumpkins releasing chemical compounds to lift your spirits and trigger feelings of well-being! This was quite an average rendition, with fine puree and a slight grated texture which I liked. I found it a tad too sweet for me though, and thought that the natural taste of pumpkin could be accentuated further. I’m never a fan of aglio olio so this didn’t appeal to me but was a hit with my companion. 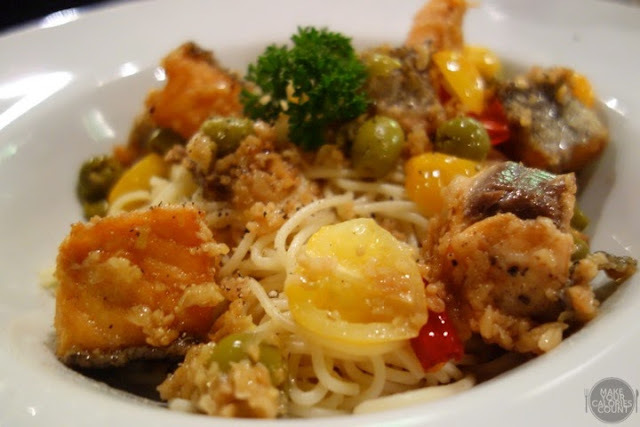 She commented that she loved the flavours, and it was more robust compared to the usual aglio olios she’s tried. Perhaps it was the portion I took which had been missed out while being mixed together, I found it a little too bland for my liking. The noodles were cooked al dente, the way I like it though! The cubes of salmon were a tad too dry, and it was slightly overcooked hence the tougher meat we got. It was a dish too bland for my palates and I would have preferred a stronger flavour to go. This was one of the signatures recommended, and the plating had already won half the battle. 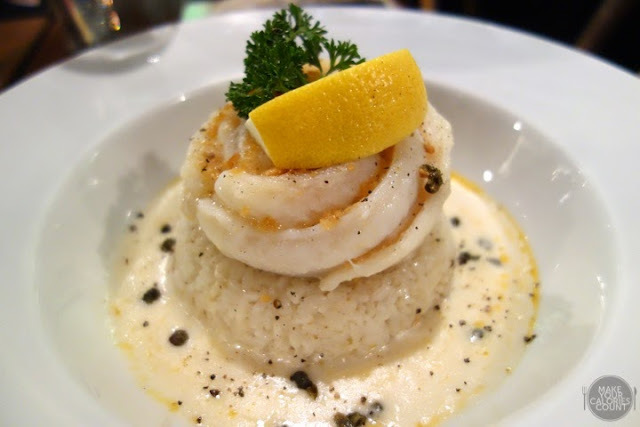 Looking at the menu stating pacific dory fish fillet and creamy rice, it’d never occurred to me that presentation could have been so much prettier, creating an image of an ocean coupled with its name. My first reaction when I tried a mouthful of it was – omg so flavourful! Very atypical of dory fillet dishes, I’ve always thought of it as a bland healthy dish probably due to its colours, but this managed to surprise me with a rich savoury burst of flavours from the cream to the freshness of the dory, accentuated by the dash of pepper they add upon serving. I’d also loved the rice accompanying the dory, slightly sticky with Japanese pearl rice used. I thought it was a good combination but after a while it tends to get abit heavy with the rich flavours, hence feeling jelat. Great for those who’re looking for strong flavours! A meme on its menu stated, ‘when in doubt, order the ribs’. And I guess it pretty much worked that way for me. Not knowing what to order, I decided to go for the ribs, and find out what exactly was so highly raved about by Rozz. 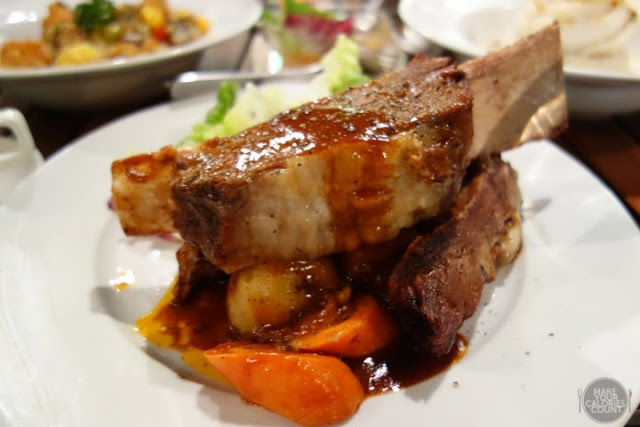 All of us got a shock when we saw the serving portion, with a huge rib bone sticking out just like that of T-rex’s. Immediately I felt too carnivorous having that by myself. Can't wait to dig in with all that meat in front of me, I was pleasantly greeted by tender off-the-bone meat that was well-marinated to give a robust flavour with every bite you take. With just enough fats (or so I think), I like how it helped to soften the texture of the meat, melting in your mouth with the lean meat. There was then a slab of fats nearer to the side of the dish that got a bit too overwhelming for me, that I ended up removing it for fear of choking up my arteries. Flavourful and tender, it made sure that my jaws weren’t working too hard, but there was just the monotony of the texture that I thought could have been better perhaps with more baby roasted potatoes to complement. I thought the portion was too huge for me, especially after 2 starters and the sight of it just reminded me how much I seemed to have eaten. 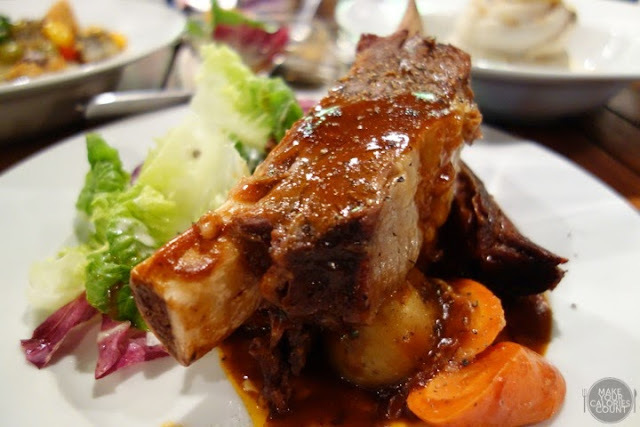 If you’re feeling especially carnivorous, this would be the perfect dish! A place of warmth and prompt service, it feels like every staff is extremely attentive to our needs and never fail to inject some fun and humour during our dining experience. We’d certainly enjoyed the food, albeit feeling a tad jelat after all the rich flavours. A place that I’ll visit again if I’m around the area and looking for some nice chillin’ space, but not one that I’ll specially make a trip down to Simpang Bedok for!